This is a recipe that I have adapted over the years from a Delia Smith book! I love Delia’s recipes but found that the resulting cake from her Carrot Cake recipe was not quite big enough for my liking – I do like to provide generous portions! I have also added Orange Extract to this recipe as it gives a much stronger flavour than orange zest and is far less messy to use. Good quality natural Orange Extract is divine. I always couple my Carrot Cake with an American inspired Cream Cheese Frosting and I love to decorated with handmade Sugarpaste Carrots, though chopped nuts are just as attractive. Whisk the sugar, oil and eggs until combined. You will need to whisk until the sugar is all dissolved and this should take 3 minutes or so. Add the orange extract. Combine the flour, mixed spice and bicarb in a separate bowl and fold this into the wet ingredients a third at a time. Add the carrot, sultanas and coconut to the cake mixture and fold these through until all are well covered. Spoon the cake mix into two lined 8” sandwich tins and bake until risen and springy when pressed lightly. If you are unsure, a skewer inserted into the centre of the cake should come out clean or with only a few crumbs on it. Leave the cakes to cool in their tins for 10 minutes before turning them out onto a cooling rack to cool completely. 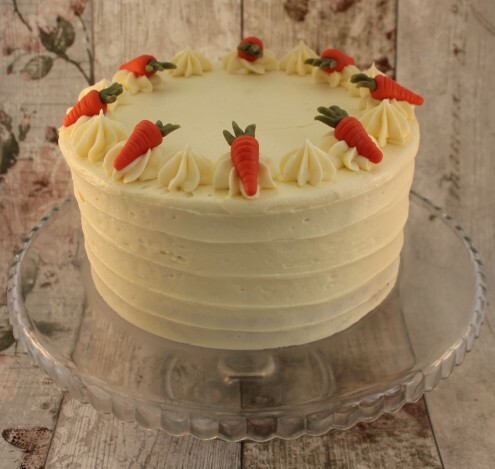 Fill and decorate using Cream Cheese Frosting and some Sugarpaste Carrots.